The cane back chair makeover includes a new seat cover made from a vintage pillowcase and dry brush painting. 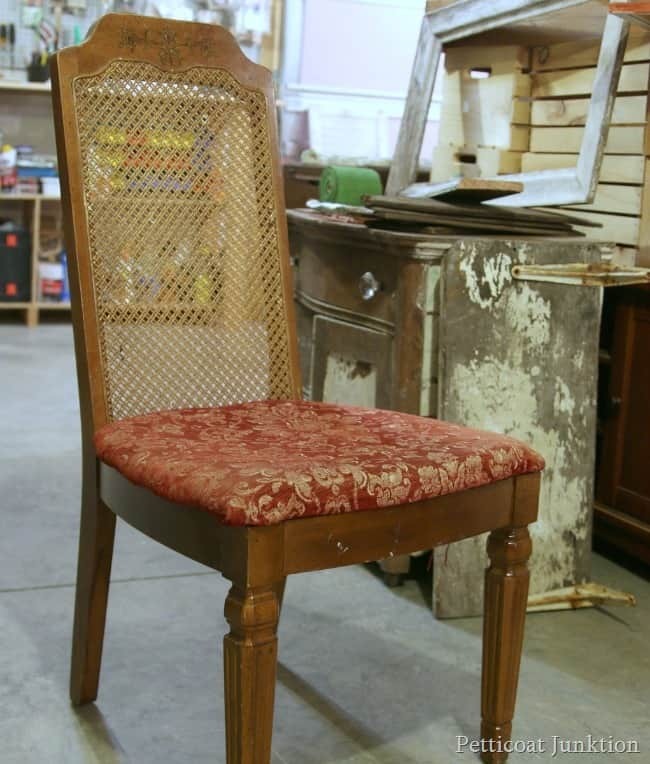 The cane back chairs are the perfect makeover project and there are a ton of them out there. The cane looks great painted. See what I mean. How pretty is that chair. I wasn’t sure the polka dots would work with the cane but I think they do. What about you? The chair looked like this when I found it at my fav junk shop. Not too much to look at but I saw the potential. 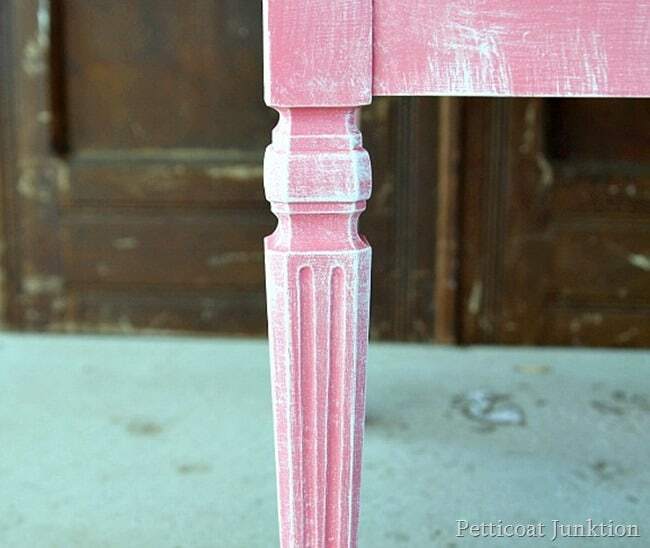 I painted the chair Rose Heartstring ( a Glidden paint color), the same coral paint color I used on the Nursery Dresser. 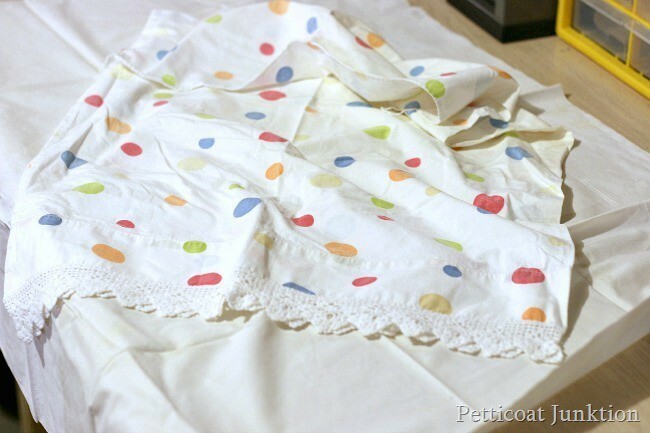 The pretty polka dot fabric with the lace trim is one of a pair of pillowcases I bought at an antique shop when we lived in Florida. I love the pillowcases. The colorful polka dots and the pretty lace trim had me at hello. It was hard to sacrifice one of them to this chair. But it went perfectly with my vision and the pillowcase was just taking up space in the closet. (Am I the only one with too many linens?) I use one of the pillowcases on the bed in the granddaughters bedroom. Since the pillowcase fabric is thin and the original chair seat covering was dark I used a layer of white fabric (old sheet) under the decorative pillowcase. I have a supply of white sheets and pillowcases to use for projects like this. You can pick up sheets at thrift stores for a dollar or two and they also make good lint free waxing cloths.I cut a piece of sheet to fit the chair seat. The padding on the seat was still firm. I did not want to remove the original fabric so I sprayed it with Simple Green and freshened it up. 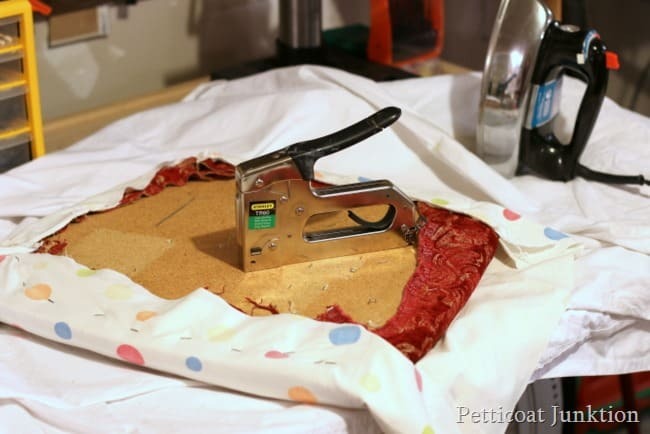 After cutting the pillowcase to size I ironed and stapled the fabric to the seat. Always staple opposing sides first and pull the fabric tight.Work the corners as best you can to get out the folds and wrinkles. If you’ve never covered a chair seat and need more details I have a complete chair seat recovering tutorial here. The coral paint looked too one dimensional so I dry brushed it with white paint. I didn’t know if I would like the way the white paint looked on the coral but I thought what the heck. If I didn’t like it I could paint over it. I can’t tell you the number of times I’ve changed paint plans on furniture projects. Some of my pieces have more than 4 coats of different colors of paint….really. If you don’t like it…paint over it. I told you the cane looked good painted. And the dry brushed white really enhances the look. 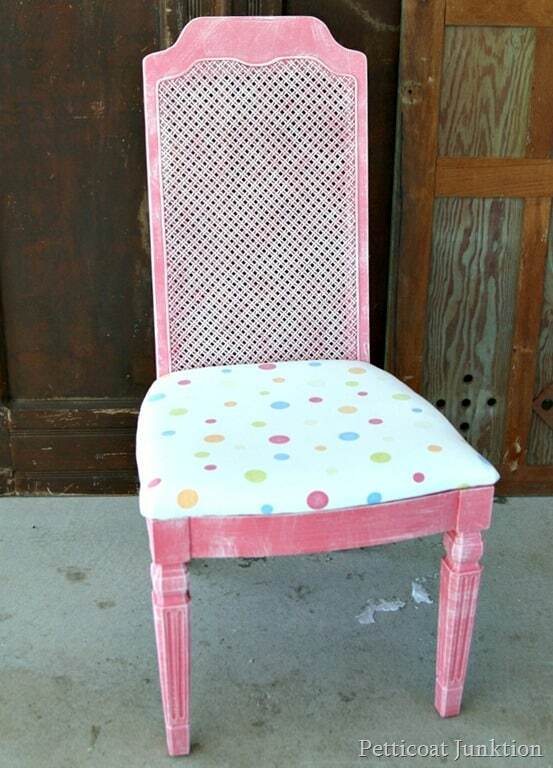 I painted a set of the cane back chairs white and covered the seats with drop cloth (click here). Another way to highlight details like the lines on this leg is to distress the paint. 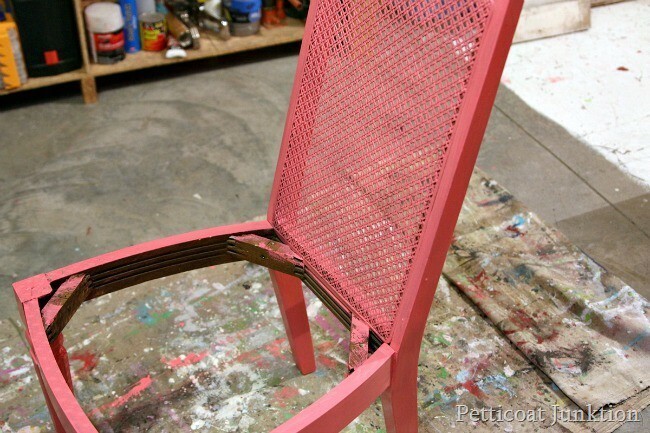 Before I started painting furniture I couldn’t imagine painting a chair and recovering the seat. Now it’s old hat. It’s really, really easy. 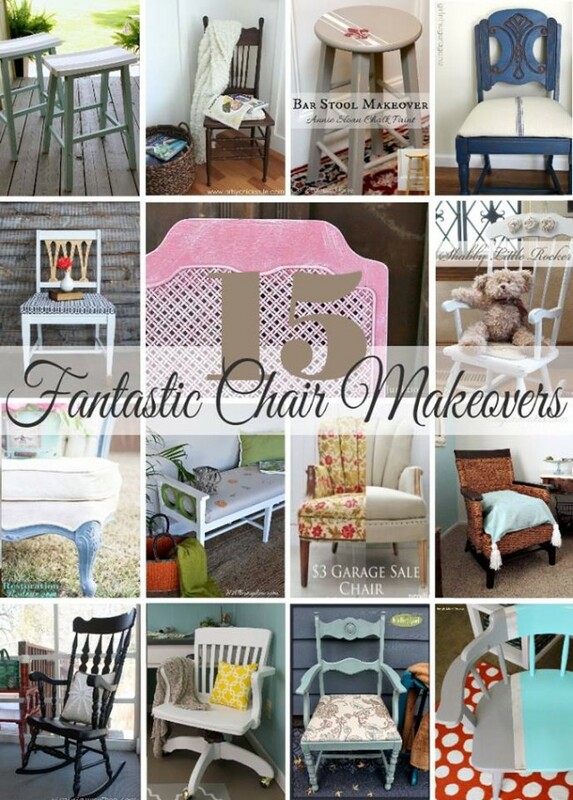 If you haven’t made over a chair give it a try. Share your thoughts please and then visit the photo links below. My friends always have great project and we all did chairs today! 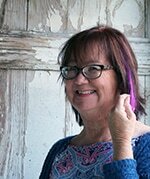 Such a fun makeover, Kathy. I’m like you and change paint colors multiple times during some projects. I love the pillow case! I love the colors! 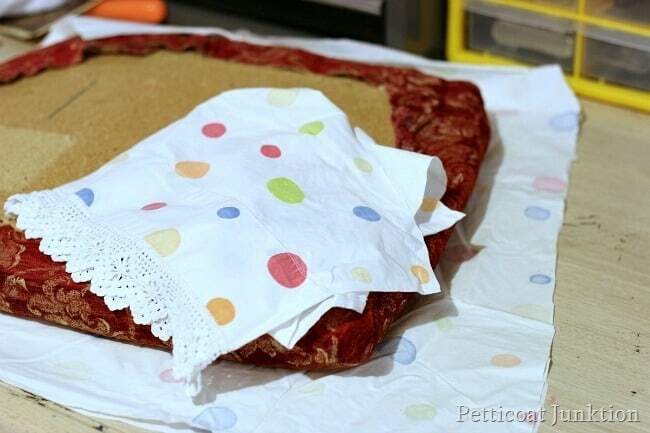 Great idea to use a pillow case. This would be so cute in a little girl’s room! So pretty in pink and polka dots! Love the dimension you added to the coral and what a clever seat recover. That’s one cute, happy chair now; I love it! Kathy I love, love, love your chair. What an improvement!!!! Such a cute chair I can imagine how darling it would be in a girls room:) The pillowcase was the perfect choice for the chair too. 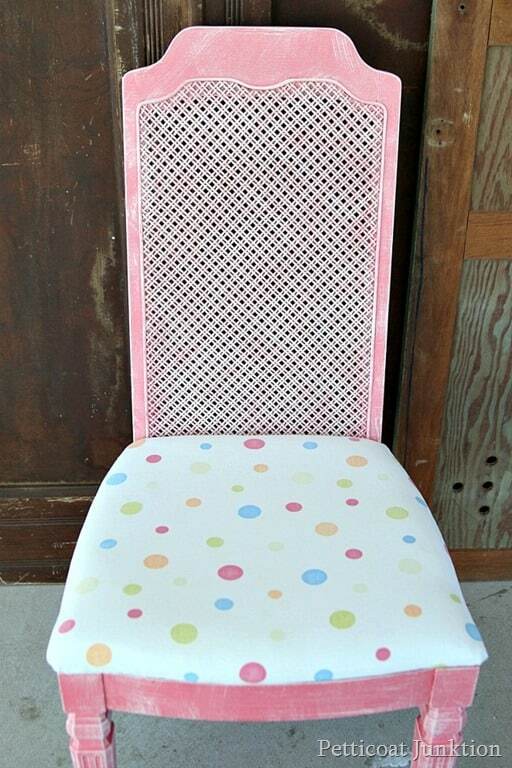 Fun color and chair fabric! I would love to have those pillowcases!! Love it! That is the cutest chair ever! Love the color and polka dot pillowcase. Great idea! So cute! I love the added white wash effect and that adorable fabric! I love the color and the fabric is so playful!! 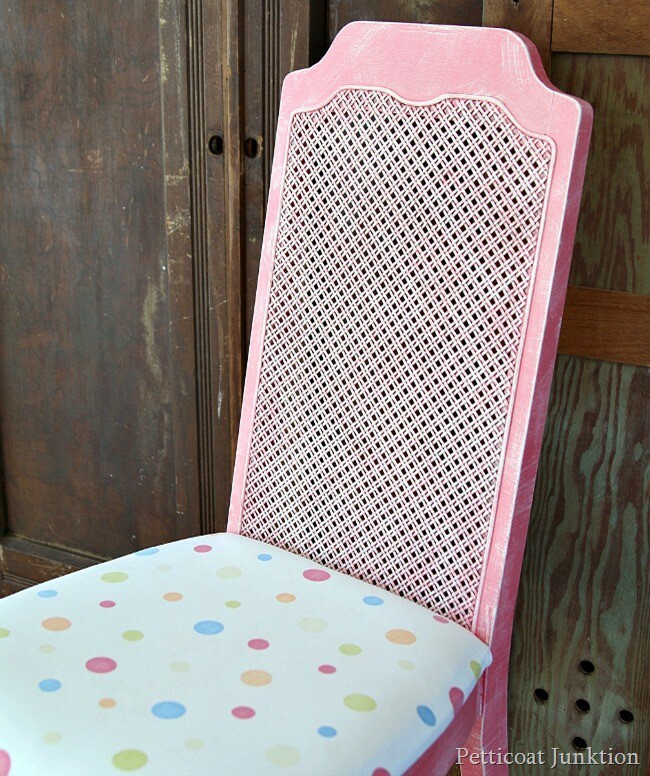 Such a pretty chair makeover for a girl’s room. I think the white wash definitely gave it some dimension and softened the pink. Beautiful! This makeover is perfect for a little girl’s room. 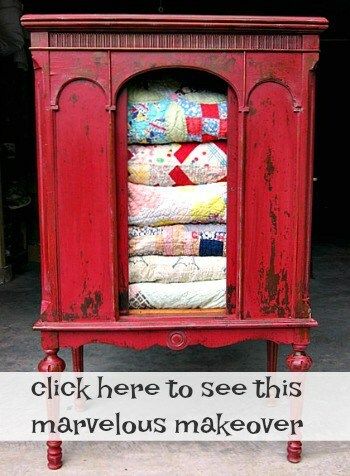 I love the idea of using an antique pillowcase for fabric. It’s perfect for this piece. This is SO gorgeous!!! I wish I had a little girl so I could put this in her room! A genius idea to use the pillow case as the fabric for the seat. Love it Kathy!! 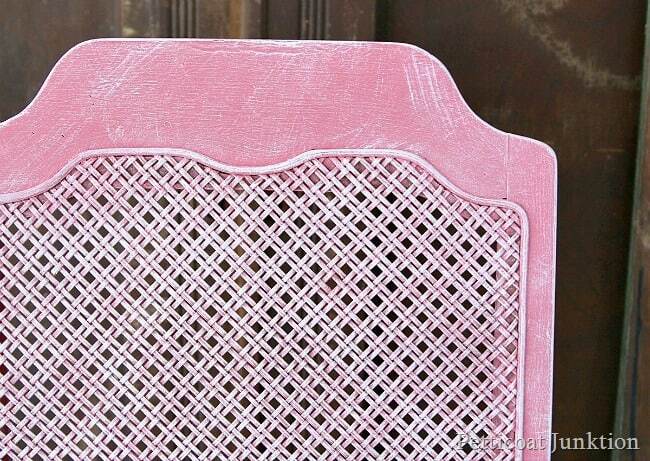 This chair is so pretty! The pillowcase is perfect for it.